The Aran Islands, the home of the famous sweaters (at least, when you have seen two souvenir shops, you will have discovered these sweaters are famous). We have seen no sheep on the islands, so we wonder if they are really made there. At least not all of them: there just don't live enough people to produce so many sweaters. Still, the sweaters are warm and beautiful, and not expensive. 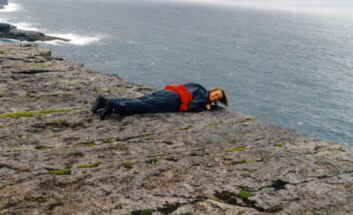 The islands (there are three in a row), are the parts of a limestone rock above sea level. There is a lot of stone on the islands. Sand even has to be imported. A stone wall around the meadow is not special, the meadow itself is! That means, we THOUGHT the walls were not special. From Roismhaire Niccionnaith we learned these the stone walls themselves are VERY special. "Firstly when the land was cleared by extreme physical labour, the rock pavements that had to be broken up and moved by hand became the walls around these 'fields'. Each farmer has his own method of dry stone wall building, and it is amazing that his handiwork can be distinguished from someone else's. This art is passed down generation to generation. The stone walls are also remarkable in their strength, given the high winds and storms that hit the islands - and this is taken into account during construction. remember no concrete or binding material is used. 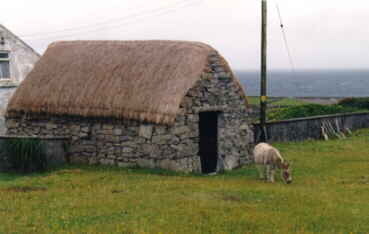 the structure is all important, and this allows wind to pass through the walls easily, giving them stability in gales. The walls have no gates but will have one area in a lot of cases where some rounder stones are placed, that can be rolled to one side to let cattle in or out, and then easily rolled back. 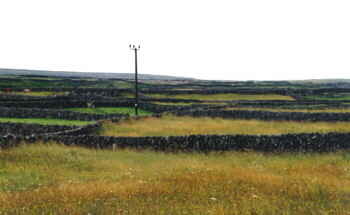 There are over 1000 miles of stone walls on Inis Mor (not bad for an island that isn't even 10 miles long!)." And WE thought the walls were just walls. Oops ! 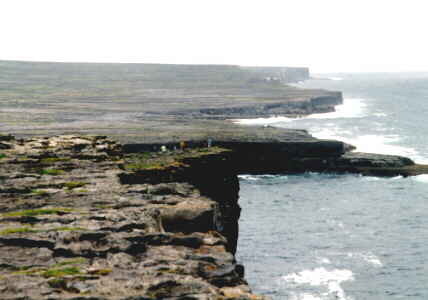 Aran or Inishmore, the biggest island of the three, has impressive cliffs. 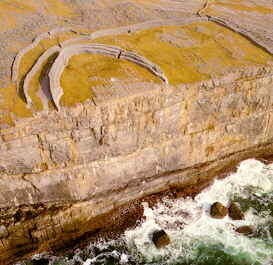 At several points prehistoric ringforts are built: Dun Aengus, and Dun Duchathair are the most known. For what or who they were afraid of is not known, but it certainly wasn't the sea. 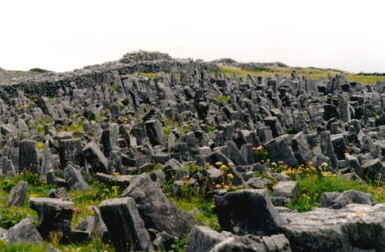 In addition to three walls, Dun Aengus is surrounded by this prehistoric minefield. Crossing it is not very difficult, but imagine a couple of archers on the walls and you recognize its defensive value. You can bring your bike on the boat to the island, but you can hire a bike as well. Alternatively, you can try a mini-bus or a cart-and-horse. Or you can try to seduce this donkey into riding you around (we couldn't even let it rise its head). With a length of 14 km and a width of 4, you can even see most of it in one day by walking.